Yu Ming Yi Lei An (Continuation of Famous Physicians' Cases Organized by Categories, 1770). 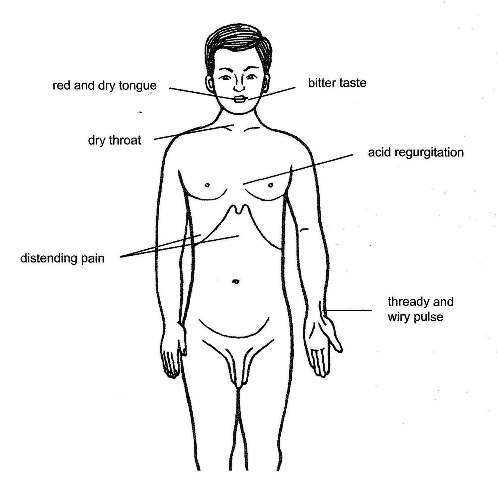 Traditional: Liver and Kidney yin deficiency with Liver qi stagnation, marked by pain in the chest and epigastrium as well as hypochondriac region, acid regurgitation, bitter taste in the mouth, dry throat, a dry and red tongue, and a thready and weak pulse or a thready and wiry pulse. It is also used in the treatment of hernia. Modern: Chronic hepatitis, peptic ulcer, diabetes, chronic gastritis, neurosis, PMS, herpes zoster, primary stage of liver cirrhosis, hypertension of pregnancy, retinitis, and stomatitis.